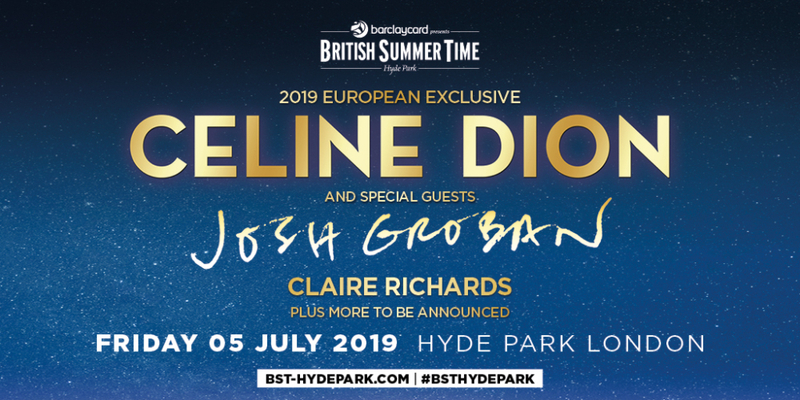 Céline Dion will headline the Great Oak Stage at Barclaycard presents British Summer Time Hyde Park London on Friday 5th Julywith Special Guests to be announced. The legendary Canadian vocal powerhouse – Celine Dion has sold over 240 million records worldwide (more than any other BST Hyde Park headliner to date) and is renowned for incredible live shows and a monumental vocal range. She will be one of the most unforgettable acts to have ever graced the Great Oak Stage in Hyde Park. "It's my first time doing a show in beautiful Hyde Park.... I'm so excited. I love London and it's a great honour for me to be part of the Barclaycard presents BST Hyde Park concerts. I can't wait.... summertime in London, here we come!" Provisional Times - Main Gates Open: 14:00H – please note the gates will be open approx. 60 minutes early for those customers who have Diamond View and Barclaycard VIP Summer Garden tickets * The Ultimate Bar * Opens @ 13:00H or arrive at your leisure. Age restrictions - Anyone under 16 must be accompanied by a parent or guardian (18 or over) - Disabled Access - All tickets are available via the festival website or AXS.com. There is a Wheelchair platform and an Ambulant area. All tickets come with 1 free personal assistant. We regret that special access tickets are only bookable via the BST website.